“She”, a collection of poems is an exquisite writing on women’s position in the contemporary society which flows like a river from one issue to another. Like the seasons of sufferings and creations, the poems are also the blend of grief and hope in which women are existing. 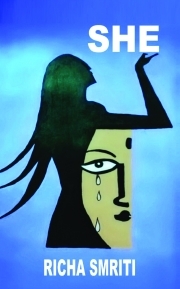 The poems mirror for awareness towards society which will change their views filling positivity in the society for welfare of women and their progress. Richa Smriti is a research scholar of Lalit Narayan Mithila University. She has great compassion for women's misery. She is associated with Navodaya Mission, an NGO active in Sonebhadra/Singrauli for grass-root activities for woman empowerment specially development of girl child. She has been writing on various social issues since her school days. Her PhD work is also on Guy de Maupassant, whose writings depict the contemporary society of France.